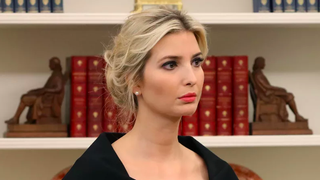 Two years after Hillary Clinton lost the presidential race to a rotting hair ham “because her emails,” the Washington Post reported today that Ivanka Trump has sent hundreds of official emails from a personal account. Do you ever want to laugh, but also tear your laptop in half and swallow its shattered remains just to feel something other than impotent rage? To be clear, what Ivanka did is different, because Ivanka didn’t set up the server in the basement of Clinton’s Chappaqua home, and is also not named “Hillary Clinton.” Do you understand? I don’t. Recall that Ivanka’s presence in the White House is already on dubious ethical footing at best, and in any normal circumstance would have anti-nepotism advocates howling at the gates. But this isn’t normal! This is hell.